South Beach soon will be home to studio and gallery space for music, art and architecture students, as FIU’s College of Architecture + The Arts expands its artistic footprint this fall. 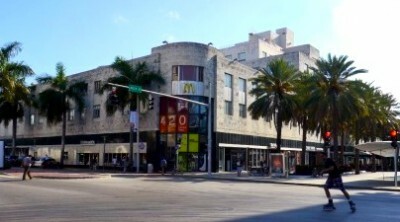 This fall the College of Architecture + The Arts (CARTA) will take up residence in 16,000 square feet of space at 420 Lincoln Road, a 1940 Art Deco icon, just blocks from the New World Symphony, Wolfsonian-FIU and the Bass Art Museum. FIU’s newest site is owned by one of FIU’s strongest supporters, former U.S. Ambassador to Belgium Paul L. Cejas, whose name graces the College’s School of Architecture building at the Modesto A. Maidique Campus in West Miami-Dade. CARTA Dean Brian Schriner explained that the 15-year lease agreement with 420 Lincoln Road points to a commitment to expand collaboration with other cultural institutions and partake in the creative energy that makes South Beach unique. “In this international and creative environment, our faculty will collaborate with prominent artists, scholars, and designers to offer our students an exceptional educational experience that is truly Worlds Ahead,” Schriner said. A design studio for 70 graduate students in architecture, interior design, and landscape architecture. A gallery with exhibition and performance space as well as studio space for graduate visual arts students. Music practice rooms and an ensemble room that will enhance the College’s collaboration with the nearby New World Symphony. In addition, this site will be the home of the College of Architecture + The Arts’ new Office of Engaged Scholarship and Creative Activities, whose mission will be to use design, visual, performing, and communication arts to engage with the community in collaborative problem-solving. The office will work closely with the University’s Office of Engagement and the Office of Sponsored Research Administration to generate new opportunities in the form of contracts, grants and other community-based projects. Earlier this year, FIU announced plans to expand its presence in downtown Miami by leasing two floors at 1101 Brickell Avenue. FIU Downtown on Brickell will open its doors later this summer with graduate degree offerings in business, public administration and global governance. Media Contact: Maydel Santana-Bravo at 305-348-1555. This is such an amazing idea and I feel it will bring a whole new level of experience and curriculum to the FIU students. Kudos to CARTA , Mr. Cejas, dean Shriner and all the people who made this happen. It is extremely cool for them to be on Lincoln Road. FIU is so dumb… With the cost of that you can build 2 more houseing parking lots which our school actually needs. You could take the bus, ride a bike or just move your body. Concrete installations are killing the environment. Good for FIU and the students. Have you ever lived at FIU? I’m guessing not because you would know you have to park 2 miles away from your dorm because there’s no parking. Why don’t you park a few blocks from your home and carry your heavy crap see how that works for you after 3 months. I could care less about the environment at FIU because 80% is just grass or dead. Paying RENT on Lincoln Road is more money a month then you probably make in 6 months. So don’t try to insult me and tell me to “move” when i pay 6k a semester to live on campus and prices are getting up to pay for this. It is great to see FIU expanding!!! Great news!